125,000 square foot Class A multi-tenant office building. 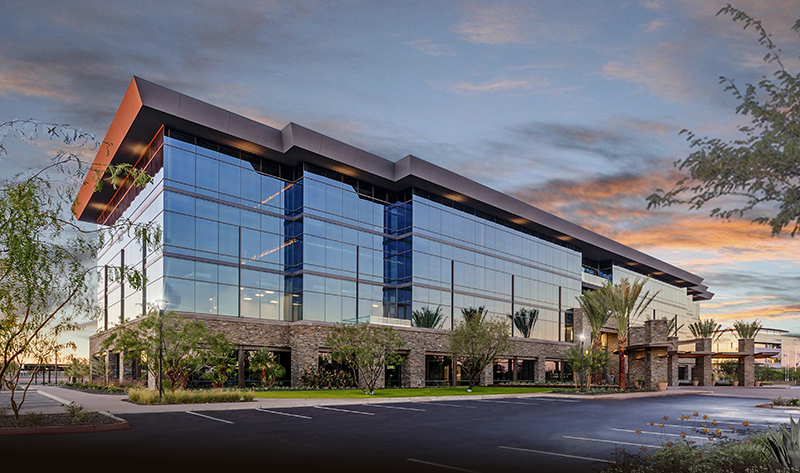 Two 60,000 square foot, 2-story medical and traditional office buildings will be ideally located along Rivulon Boulevard near the corner of Gilbert Rd and the AZ 202. 17,000 square foot retail center near Gilbert Road and Rivulon Boulevard is now available. The highly visible center includes restaurants and other service retail space. A neighborhood of 2-story buildings ranging in sizes from 80,000-120,000 square feet is currently in pre-development. These large, open, and flexible configurations are ideal for technology centers, creative firms, and back office users. The large scale of the project will allow for build-to-suit opportunities well positioned in the corporate campus. Nationwide Realty Investors is now accepting proposals for the prospective hotel site at Rivulon. The site is between 6 – 9 acres, to be determined based on proposals. Hotel will be easily accessible from the newly completed East Rivulon Boulevard roundabout.